Hozzt Review 2019: Is Hozzt a Good Hosting? Hozzt is a Turkish web and server hosting provider that has left no stone unturned when it comes to the features, services, and support. 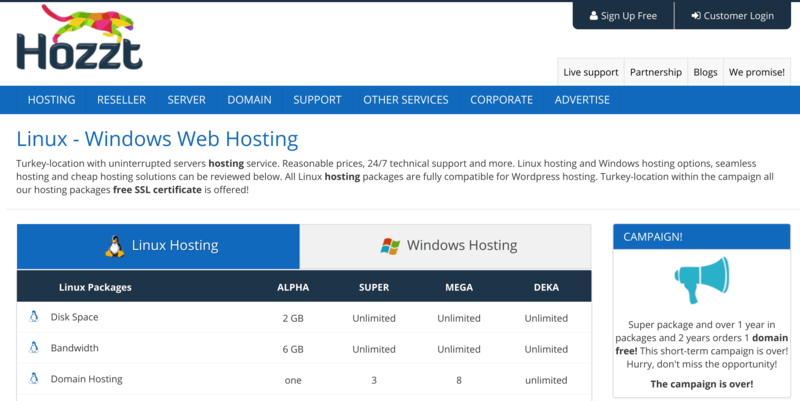 Find great hosting products with a great range of prices, billing options, and customizability. Hozzt is a brand operated by Pupa Services, a 100% Turkish company that has been providing web and server hosting services since 2006. They take a user-oriented approach to making their services more accessible and trustworthy by offering free migration, great technical support, the best possible price, and 99.9% uptime. This promise is realized in part thanks to partnerships with companies such as Comodo, Microsoft, HP, and Intel. All their data centers are located in Turkey and their services are provided in Turkish. You can unlock even more utility with their hosting-related services that include customized support packages, website design and development, banner/logo design, and SEO services. Anything you can think of to do with building and managing a website hosting solution, they probably offer it. Hozzt offers both Windows and Linux products, which come with CPanel or Plesk respectively. Web Hosting Manager (WHM) is also provided to help resellers manage their servers. CMS-specific web hosting such as WordPress, Joomla, and Magento is also on offer. You get a 15-day money-back guarantee on all hosting or server products, and Hozzt claim to be cheaper than their Turkish competitors. Web Hosting: You have the choice of either Linux or Windows machines at exactly the same price. All plans come with a free SSL certificate included. The Super, Mega, and Deka plans have monthly, yearly, biennial, and triennial billing options with unlimited disk space, bandwidth, databases, subdomains, email accounts, and a free domain. The Alpha plan has only yearly, biennial, or triennial billing, with limited resources and no included domain. Reseller: Once again you can choose between Linux or Windows hosting. Unlimited sites, databases, email accounts, subdomains, and cPanel accounts are allowed. Disk storage and bandwidth are restricted, from 30 GB to 150 GB (storage) and 250 GB to 1500 GB (bandwidth) unless you are on an unlimited plan. Monthly to triennial billing is offered. VPS: You can conjure up your own VPS configuration by choosing from 16 levels of “VPS Beans” that provide up to 38.4 GHz of processing power, 8 GB of RAM, 160 GB of storage, and 48 TB of bandwidth. You can then add up to another 375 GB of storage and 7 GB of RAM. Dedicated Server: You can choose between four dedicated server products: three Intel Xeon Quad-Core, and one AMD Opteron options. All servers have a 100 Mbit connection plus high amounts of RAM and storage, A + B redundant power, and five IP addresses. While the hosting is very cheap, there are a few upsells including a small search ranking add-on charge that’s there whether you selected it or not. You can pay with a number of different payment methods. All products come with 24/7 support via live chat, email, phone, or tickets. Hozzt promises a response time of less than four minutes to any queries, but in my experience this promise is not always met. Not far off, though. They also provide free managed support services to all their dedicated server clients. From fantastic freebies to superior services, Turkish website owners looking for a hosting company have some great options at hand from Hozzt. Wondering how Hozzt stacks up against other Web Hosting companies? Enter any other Web Hosting company and we will give you a side-by-side comparison.